Princeton-based advertising agency Ferrara & Company won a Best TV Award at La Fleur’s annual Lottery Symposium, it announced recently. 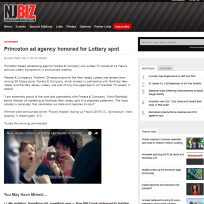 Ferrara & Company’s “Anthem” 30-second spot for the New Jersey Lottery was chosen from among 39 lottery spots. Ferrara & Company, which worked in partnership with Northstar New Jersey and the New Jersey Lottery, was one of only five agencies to win the Best TV Award, it added.